The Silicon Valley Animal Control Authority (SVACA) staff and volunteers are quite proud of all their animal guests and believe they are among the most handsome, intelligent and loving animals in all the Bay Area. 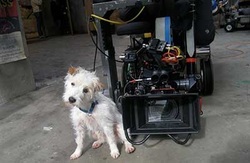 They may be onto something as 'one of their own' has achieved fame as "J.R.," a dog adopted from SVACA's Animal Care Center in September 2007, stars as “Friday” in Hotel for Dogs. "We are so very proud of our little "J.R." as he has certainly come a long, long way. Our staff found him one morning, cold and alone, at our animal care center as he had been abandoned outside our door. Staff quickly took him in and provided him with 'TLC' until we were able to find him a new home. And what a home we found," says Dan Soszynski, SVACA Executive Director. He adds, "We believe shelter animals make the best companions and "J.R." is a perfect example." SVACA rescued eighteen baby chicks who had been shipped in a small box via the US Postal Service from Rhode Island to a home in Santa Clara. Several were dead and the recipient refused the delivery. Unfortunately, this archaic and inhumane practice is legal. Luckily, this story has a happy ending. Watch the video for the full story! Francesca Found Her Forever Family! Francesca came to SVACA with a broken leg. We believed this amazing cat deserved a second chance to find a new family and with the help of funding from the Animal Assistance Fund, our medical team surgically repaired her leg. She then spent several weeks in the care of a foster home while she recuperated. When she was fully healed, she returned to SVACA to find her forever family. She stayed with us for over a year until that special day came when she was adopted. 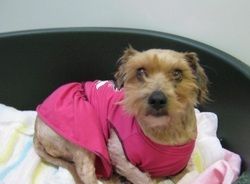 Fredo had an unfortunate summer as he had escaped from his former owner's home, was hit by a car and severely injured his hip. He was taken to a veterinarian but his owner did not provide the necessary treatment. A short time later, he again wandered away from home, bad hip and all. Luckily, a Good Samaritan found him and brought him to SVACA where we were able to provide proper care and treatment with the help from donors who gave generously to SVACA's Animal Assistance Fund. Dr. Kureshi and the caring staff at Cupertino Animal Hospital surgically repaired his hip. After spending three weeks in a foster home, he was quickly adopted into his new forever home. Amazingly enough, Fredo kept his sweet and friendly disposition throughout his long journey. See Fredo in action. "Faith" was a special girl who had an unfortunate beginning before coming to SVACA. Her leg was badly broken in her last home and for some reason she was never taken to a veterinarian. Somehow she strayed from her former home and was found by a caring person who brought her to SVACA where she received much needed care and medical attention. Her previous owners never did come and look for her so Dr. Kureshi of Cupertino Animal Hospital generously donated his time to care for her. The Animal Assistance Fund was used to cover expenses. "Faith" was then cared for in a foster home until she could get back on her feet. She was soon returned to SVACA and, after only a few days in the adoption gallery, quickly found her new forever family! Click here to view a video of Faith.
" Trinity" was one lucky gal who received a " second chance." Animal Control Officer Morris investigated a complaint of children abusing a small dog in Santa Clara and found a Chihuahua with a broken leg that had been left untreated. The owner decided to surrender the dog as she had only recently acquired her and admittedly could not provide the required care. " Trinity's" leg had been so badly injured so long ago that it had to be surgically removed. Dr. Kureshi of Cupertino Animal Hospital generously donated his time and performed the surgery. The Animal Assistance Fund was used to cover surgical expenses. " Trinity" quickly recovered from the surgery and was adopted into a loving home! Samson was abandoned in SVACA’s night drop kennels after hours by his owner. There was a note stating his name, and that his owner had lost their job and could not afford to take care of him. It was immediately clear that Samson was in need of veterinary care, which is perhaps the reason he was left at SVACA. Samson had quite a number of existing health problems, including tapeworms and bad teeth, not to mention he was quite nervous and guarded, which is common with animals who aren’t feeling well. Though Samson had a multitude of health issues, they were all treated by our medical staff . As he began to feel better, his temperament improved and it wasn’t long before he started soliciting attention and pets from the staff. Due to his age, it was a little challenging getting him a new home, but between his amazing appearance and ever-evolving lovable personality starting to break through, staff and volunteers were hopeful. Suddenly a couple walked in who had adopted from SVACA back in 2007, and expressed interest in adding Samson to their family. By this time, Samson was friendly with most, and extremely sweet to a few, and he took to the couple as if he’d known them his whole life. Joy is a Cairn Terrier that was abandoned in a crate in front of the shelter along with a Chihuahua late one night, and discovered by staff the following morning. Although a little more outgoing than the Chihuahua , later named Grace, she was a bit reserved and nervous around the staff. Both dogs eventually came around and shed their defensive behaviors. Once placed into the adoption gallery together, they received even more socialization by volunteers, which only blossomed their personalities and made them more adoptable. Though Joy was the more outgoing of the two, Grace was adopted first. Joy seemed to adjust to Grace’s departure pretty well, much to our relief. After several weeks, it became Joy’s turn to go to her forever home with her new family! Petunia arrived at SVACA with almost all of her long coat severely matted to the point that she was very uncomfortable and avoided humans for fear their touching her coat would induce more discomfort. Petunia was very still in her kennel, as though any movement was causing pain of the mats pulling on her skin. After a few days, she was a bit more accepting of staff when she realized we were not going to hurt her. Petunia was so matted that we could not really see her eyes, so her vision was very compromised at that time, which was another reason she was so nervous. For the most part, she was very cooperative with staff members shaving her down and eliminating her coat and mats, and cutting the hair around her eyes so that she could now see. Petunia quickly let us know that she felt much better now that she could move pain-free and see all of us clearly! It started with a small wag of her tail when she would see us approaching her kennel, to a few sitting in our laps and expressing her gratitude by licking our faces a few short days later. SVACA staff documented her transition by creating a before-and-after video of Petunia, which was posted on the website as soon as she was ready for adoption. The day the video went live, the shelter immediately started receiving phone calls of potential adopters who were amazed by her story. Within three days of being made available for adoption, Petunia was on her way to her forever home! See the video of my story below!